Making almost anything into a chalkboard isn’t hard and only requires chalkboard paint. But today I want to show you the materials I used to create an easy, light weight, attractive chalkboard for my master bedroom redo. When we did our family portrait photo shoot, I dismantled an old (ridiculously heavy) mirror to use the frame as a prop for the shoot. The mirror was just too heavy to easily hang anywhere, but the frame is lovely! 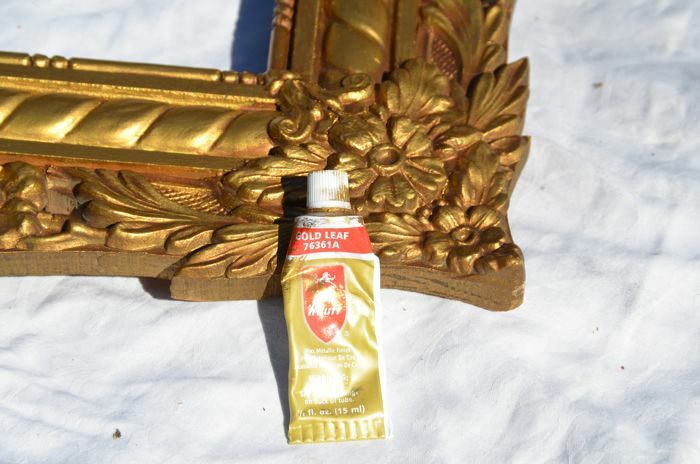 I wanted to brighten it up a bit, so I added some Rub ‘n Buff in Gold Leaf. 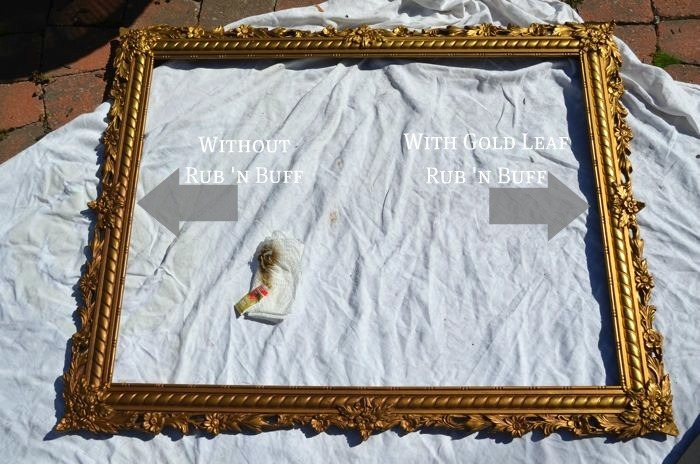 You just place a little on a paper towel or rag and rub it onto your frame. Below you can see the subtle difference it made to my frame. The right side has been rub ‘n buffed and the left is the original finish. Okay, and now for the secret ingredient….foam board. I’m a bit obsessed with using foam board in my decorating. It’s just so easy to work with and relatively inexpensive. Note: This chalkboard isn’t going to be receiving a ton of use. I’ll be able to switch up the message when I want, but if I was making this for the kids’ use I would use something studier. I purchased a large sheet of foam board for $6 from Staples (they are cheaper at Hob Lob) and gave it two light coats of Valspar Chalkboard Paint. 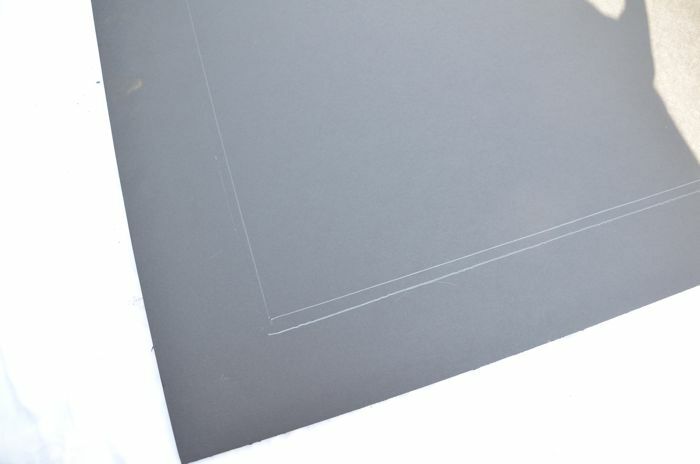 Next, I measured where I needed to cut the foam board and cut it out using an xacto knife. To secure the board to the frame, I used a tiny bit of hot glue around the edges and held it in place until dry. Voila! 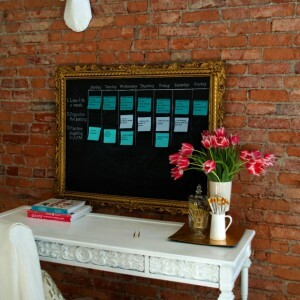 Cute, light weight chalkboard that doesn’t require more than a few nails in the wall to hang. Enjoy! Can anyone help me?? 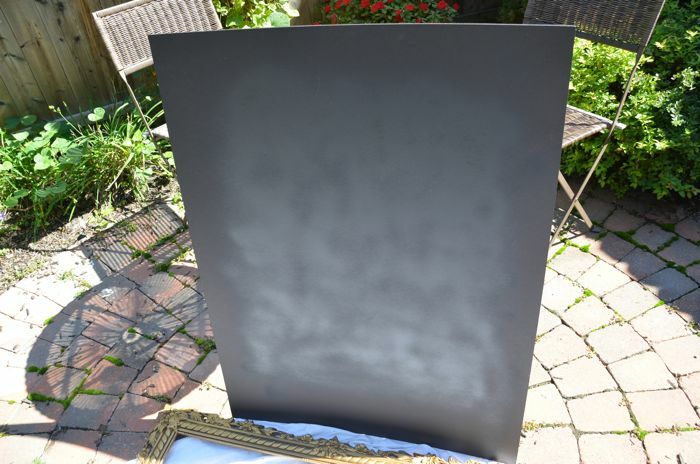 I tried to make a chalkboard out of foam board but it didn’t really turn out… 🙁 I used an all-purpose primer my foam board, then used 3 coats of chalkboard spray paint (maybe they weren’t thick enough?) and then “primed” my chalkboard using the side of a piece of chalk. The problems began when I went to write on it for the first time… The chalk barely showed up, I had to write over and over to get the letters to faintly show : / the worst part is that it seems to have indented my foam board a bit… I bought pretty cheap chalk from Meijer so maybe that’s part of the problem? Did I not get a good enough coat of chalkboard paint on my foam board?? If anyone has any suggestions I would be very grateful!! How frustrating :(. Foam board honestly isn’t the best medium for a chalkboard because it does dent. I like to use foam board for making designs with twinkle lights through the back and because it is incredibly light weight so there is no need for finding a stud or using wall anchors when hanging. It sounds like you did all the right things so I’m not sure why the chalk isn’t showing up. 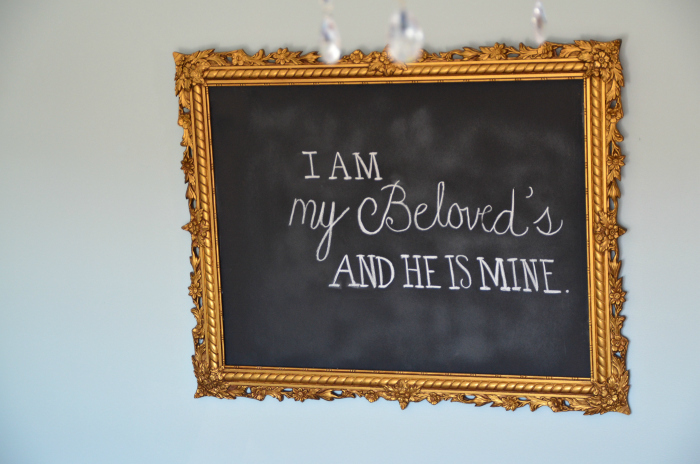 Your chalkboard is beautiful! Where do I find foam board? Thank you for the instructions for the chalkboard. 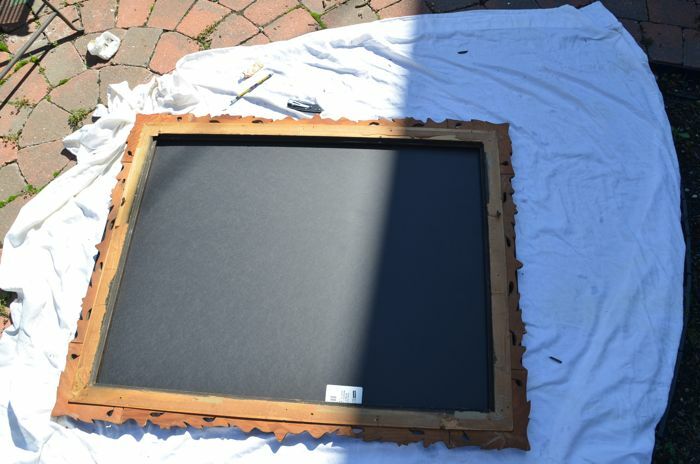 I was just thinking about making a chalkboard out of a vintage frame that I already have. Your chalkboard is beautiful. I can only hope that mine turns out as good as yours. Beth..that is stunning. I think I could wake up happy and in love:) every morning with something like that to focus on:) I love chalkboard paint and have always enjoyed a good quote. thanks for the inspiration! I’ve been making these for a while and I can’t get enough of them. I may have to start selling them soon! Yours is beautiful. That’s such a pretty frame and a great lightweight idea for a chalkboard that won’t see very heavy use! I have a frame or two tucked away that would be perfect for this! I LOVE that frame!! I saw it in your family photos before and drooled then and I am fully drooling again. I have been on the lookout for ages to find one. Looks great as a chalkboard too. i would have never thought of foam board. it seems so cheap! looks great though and polished. love it! Fabulous idea, as usual Beth! I have a bunch of foam board left over from a work project just waiting to be used this way. I just love this idea using form board. I have form board and I am going to use it for my frame I had laying around for 6 months. Thanks for sharing. This is gorgeous! Amazing idea and tutorial. It really makes your room pop! What a cute chalkboard. Love love! And the quote on it is one of my favorites. Good job girl! 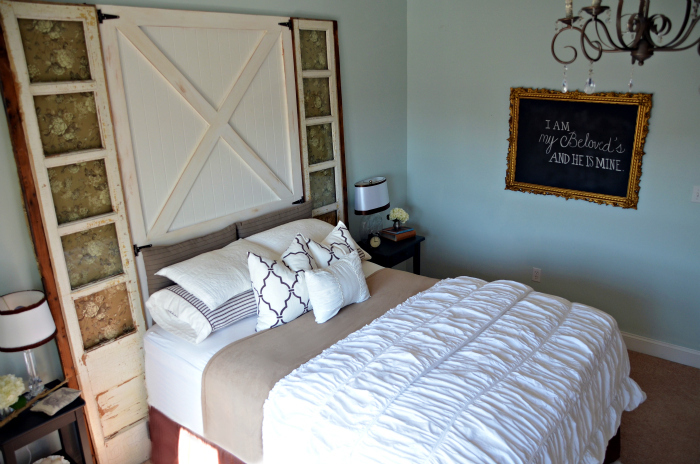 love the headboard and chalkboard….. I have a large empty frame that has been sadly sitting in the garage for months. Now, I know exactly what to do with it. I’m like you though- I want to use it in a family photo shoot first though! Thanks so much sharing this great idea!